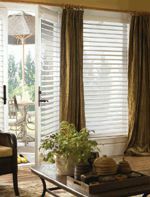 Shadings combine the beauty of a soft sheer with the unmistakable practicality of a window blind. 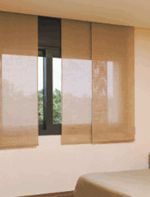 These sophisticated window Shadings are constructed of fine fabric vanes suspended between sheer facings. They can be tilted open, closed, or any point in between. When raised, Shadings completely disappear into the sleek headrail for an unobstructed view. Shadings four fabric styles can transform your room into a bright gathering place or a soothing private retreat. With elegant, clean lines and subtle colors, Shadings work well with traditional or modern decor. Their anti-static, stain resistant fabrics are quite durable. Our Panel track system is designed to bring clean lines to wide expanses of glass. Panel Tracks are custom made to cover areas up to 18.5 feet or 222 inches. Adding scale and balance to large openings, the vertical panels are available in widths up to 47″ wide depending on the size of the window and the number of panels desired. The panels stack neatly when not in use.